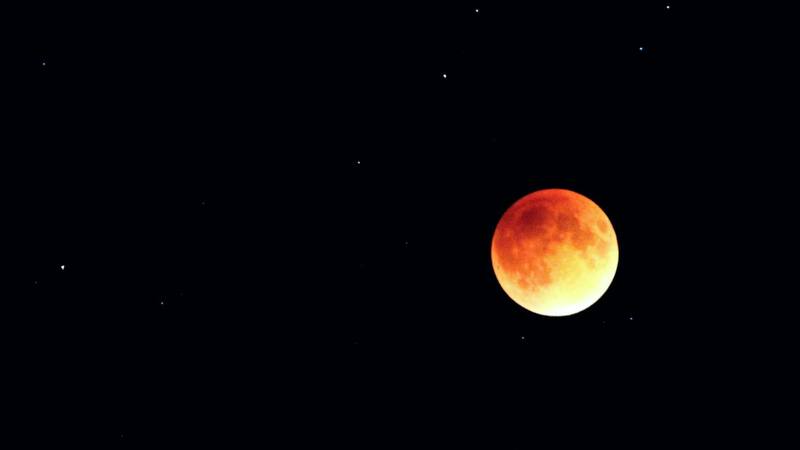 We had a crystal clear night in which to observe last night’s blood moon. Even better, the eclipse of the super moon coincided with the time the moon shines through the skylight onto our boy’s bed. So I laid down on the end of the bed, propped my feet up onto the bookshelf, binoculars in hand, and watched the show. It was late, he was tired, and so periodically I would nudge him and hand him the binoculars so he could sit up see the ever-reddening moon. At first viewing about halfway through he was nonplussed, but when the eclipse was total he looked at me and said, “That’s pretty cool.” Then he crashed back onto his pillow. A few minutes later, he finger-walked his hand down the bed and parked it gently on my shoulder. I reached up and gave it a squeeze. And when I next looked at the moon I noticed something else. Besides giving the moon more dimensions and a better-defined spherical shape, the dim light also allowed me to see the stars nearby. When there is a new moon it is easy, in our neck of the woods, to see the depth and grandeur of the Milky Way across the sky. But during the eclipse we can see the Milky Way and the moon together and for me, suddenly, the universe was real in a way that hasn’t struck me in a long time. Over 30 years ago, I sat alone on a Lake Michigan beach during a new moon. I felt the depth of the sea of stars above me, and it occurred to me that if the moon was on the other side of the Earth then I must be upside down, in danger of falling into outer space. The thought was startling enough to make me reach down to steady myself and of course all I came up with was two handfuls of sand. I had to depend on gravity to hold me in place; that thought has stayed with me. I recall that moment often because it was then that my 19-year-old self became aware of all of the possibilities and uncertainties that were ahead of me, and there was only so much I could do to control the future. There would be times when I would reach for something solid to steady me and come up with a handful of sand. Sometimes a person would be there. Other times, gravity would have to suffice. Last night when I looked out, past the moon and into deep space, someone reached for me and I was there. I was the something steady, and with my eyes on the cosmos I felt somehow worthy of his grasp. The future is as full of possibilities and uncertainties as ever, and the idea of it all being tied to a blood moon is not lost on me. Going forward, sometimes the full moon will dominate the sky, illuminating some things and obscuring others. Sometimes the new moon will let us see the rest of heaven from our darkened earthly landscape. Many things will change, for him and for me, but these – along with blessed gravity – will be constants if we can just remember to look up, together, and try to see it all.